The Y.P.R. 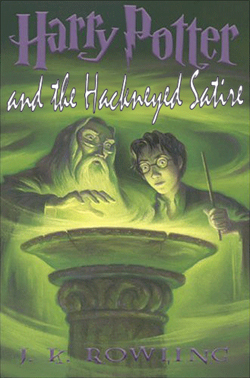 Book Club hereby declares Harry Potter and the Half-Baked Clam by J. K. Rowling this month’s selection. We’d asked for your magical parodies, deleted chapters, musical adaptations, illustrations, etc., whether you’ve read the book or not. And you certainly provided. O.K., so we got Voldemort, right, the Death Eaters, you got that part already, right? What do you mean? Haven't you been listening? O.K., fine, so Voldemort and the death eaters and the Dementors, terrorizing London, yada yada. Make it sound really good, really creepy.